Where is the best diving in Malaysia? Malaysia has some world class diving, including the famous Sipadan which features in the top ten dives of the world. The country has over 4600 kilometers of coastline and borders four seas and straits - the South China Sea, the Sulu Sea, the Sulawesi Sea and the Straits of Malacca. The South China Sea separates the two main regions of Malaysia: Malaysian Borneo to the east and Peninsular Malaysia to the west. You can dive around Malaysian Borneo all year round. The best time to dive the west coast of Borneo - Layang Layang or Tunku Abdul Rahman Marine Park - is between March and May. For the east coast of Borneo - Sipadan for example - the best time is from April to December. 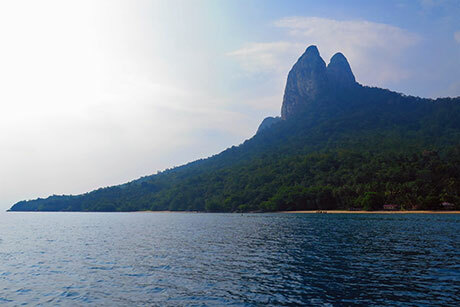 For Peninsula Malaysia diving such as at Tioman, the best time to go is from February to November. The rainy season occurs from December to March. The water temperature around Malaysia is between 27 oC and 31 oC. Most visits to Malaysia are trouble-free and it is safe to visit Labuan, Tioman, Layang Layang, Pulau Payar and most of the diving areas. However, at the moment some European Governments are advising against all but essential travel to some islands off the coast of eastern Sabah, including Mabul and Sipadan. In response the Malaysian authorities have made it compulsory to have at least one security guard on-board each dive boat there. Take out comprehensive travel and medical insurance before you travel. Tioman—the third largest Malayasian island—lies off the east coast of the peninsula in a marine park. It measures 38 by 19 km and has only one road. The water is warm, from 27 to 29 oC. The SCUBA diving season runs from early February to November: the out of season time is associated with unpredictable weather during the monsoon. The best time of the year for visibility is March � June and visibility may drop in July and August. 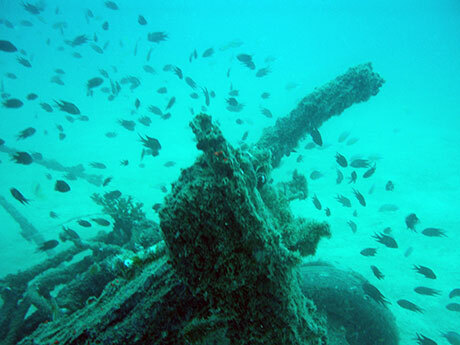 There are a few small wrecks of wooden fishing boats, which attract fish, and lots of coral. You will often see turtles but sharks are less common. You might though see black-tip reef sharks or some small Coral Cat sharks. 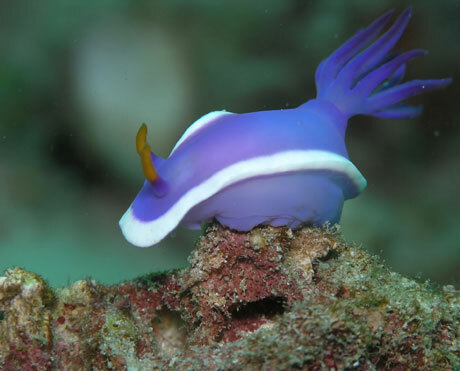 If nudibranchs are your thing you'll be happy. Most resorts accept credit cards, but there is a 3% charge. Exchange currency before you get to the island as you won't get a good exchange rate on Tioman. The nearest decompression chamber is in Singapore. Make sure you have adequate travel insurance for diving. 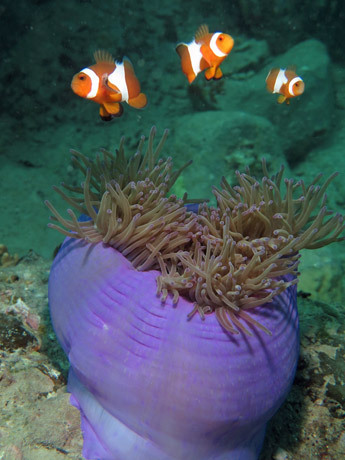 See also our report on a dive trip to Tioman, and the dive operators in Tioman page. 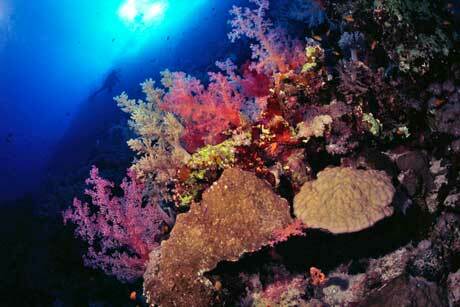 "Superb hard and soft corals, Sea fans. Lots of fishlife, turtles, fish shoals. Not much big stuff, no Manta and no Whalesharks. Some blacktip and Whitetip. Amazing macrolife, nudibranchs by the tons, very good diving - also night diving. Best WWII wrecks I have seen so far for technical divers." 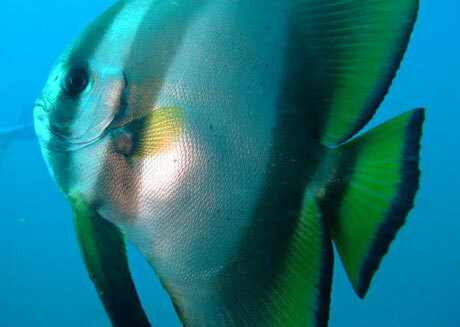 "Tioman boasts many dive centres and is a protected marine park with a wide range of dive sites." Tiger Reef is a submerged pinnacle in an exposed area. This means currents can be strong, but this also brings many different fish and some very healthy hard and soft corals. Tiger Reef is many divers' favourite dive site. "Simply Amazing with the various type of corals, ranging from soft coral to the sea feather..not forgetting the turtles and the rays...school of fishes juz swim on top of u and imagine having the sights of it even u are doing ur safety stops.."
"Lots of fish life including lionfish on the wreck and a school of juvenile barracuda patrolling above." Renggis is good for beginners and more experienced divers alike. There is a chance to see black tip reef sharks and Hawksbill turtles, both species making Renggis Island their home. "Turtles, black-tip reef sharks and some fully grown barracuda." "By now the visibility had improved considerably so we were able to see lots of fish life and many nudibranchs on and around the wreck." Good for beginners. Plenty of reef fish and the occasional turtle. Indian Walkmen, cuttlefish, blue-spotted ribbontail rays and shrimp are some of the many smaller things you can also see on this small reef system. "Very close to the Tioman Dive Centre, brief glimpse of a turtle"
There are three wrecks very close together. A metal hulled ex-marine police patrol vessel (sunk in 2012) and two older wooden fishing boats attract thousands of fish. Juvenile barracuda, fusiliers, batfish and snapper school in huge numbers around these wrecks and looking closer, you can find scorpionfish, stonefish, lionfish, nudibranchs and much more covering these wrecks. "Here there are 3 wrecked fishing boats close together. The visibility was very poor, more UK than tropical, so we stayed on just one wreck. There was a large stonefish resident and large barracuda above the wreck, and many other shoaling fish." A very scenic dive with large boulders creating hiding spots for many rays and interesting creatures. Turtles often show up at Soyak and Barracuda can be found hanging out in the current. This dive site is an outcropping of large boulders which create beautiful topography. A few swim-throughs make this site very interesting. "Another fishing boat just out across a sandy bottom from the island itself." "A reef complex close to Ringgis Island, but on this dive covered by a current. We came across 2 lost commercial fishing nets caught on this reef, showing the 2 mile fishing limit is being ignored. We understand that these nets will be removed by Tioman Dive Centre in the near future." "This shore dive is very scenic and interesting. Dropping to 10-12m out on the sand most of the site is at around 8m. There are turtles that are often present, and a whole variety of corals and fish life." " As an instructor, my favourite location is the Marine Park Jetty. It's a shore entry, with a nice artificial reef at 4-6 metres, with a slope down to high tide depths of 23m, with at least 7 sunken boats in the area, that have all become artificial reefs. It's simply the best site I've ever had for wide range of training. Best of all, being a shore dive, there's no dive boat waiting on a schedule, so instructors can take their time getting through the training objectives. The students are better for it." This island is made up of huge boulders creating a myriad of swim throughs with incredible life. Labas can be dived in two ways, either focusing on swim throughs on the East side, or diving around massive boulders around the West side. "Many unspoilt dive sites. Most easy and comfortable dives. Loads of different coral, loads of fish life." "School of fish, flowering sea wall, shark, bamboo shark, micro spesies." "Tenggol has some amazing Diving with corals far better than Sipadan but the fish life is not as good, but please don't misunderstand, it still does have fish, hehehe . Tenggol is known as the best Dive site on the Malaysian Peninsular with huge coral growth over 400 years old and as big as a car port. A quiet beach resort, Not for Honeymooners, strictly Diving. A great peacefull Island." The Pulau Payar Marine Park is in the northern part of the Straits of Malacca, near Kuala Kedah and thirty kilometers south of Pulau Langkawi. 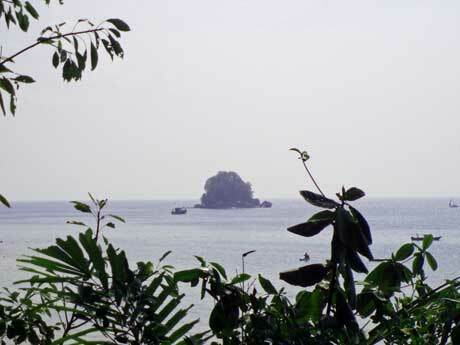 It covers the sea around four islands - Pulau Payar (the largest), Pulau Kaca, Pulau Lembu and Pulau Segantang. "Pulau Payar is the best island for diving in north Malaysia, with a lot of soft coral." "Unfortunately the visibility was poor. I believe there would be lots of things to see - if only one could see! Saw huge schools of fish though." "Beautiful soft corals, mild currents, poor visibility." Sipadan is a very small island not far from the town of Semporna on the East coast of Sabah. It is a limestone pinnacle rising from 600 metres. The boat ride from Semporna takes around an hour. Sipadan is Malaysia's only oceanic island. A total of 16,846 hectares of coral reefs and sea area around Sipadan are now officially a park area. 120 divers are given permits daily at a fee of RM40 each. This will rise in August 2018 to MYR 148.40 - equivalent to 40 USD, 32 Euro or �27. One of the best dives in the world is at Sipadan - Barracuda Point. Find a Sipadan dive resort.
" Sipadan was amazing but didn't see hammerheads." "A mixture of Wall and reef dive, loads of wildlife, including black tip, grey reef leopard,(plus others saw Hammerhead) Sharks, Turtles, Humphead Parrot Fish, huge numbers of Jacks, plus of course the famous Barracuda vortex all within a comparatively short distance "
Barracuda Point is currently rated the best dive site in the world! Wall of coral where sharks come cruising by and barracuda surround you. You are guaranteed to see big stuff here and lots of it. Occasional strong currents blast over an underwater prairie that's home to white tips, turtles, grouper, jacks, bumphead parrotfish and of course the barracuda that give it its name. "Baracuda and jet fish in large group while cross by white tip shark"
"Still the king of all dive spots: turtles everywhere, white tip and grey reef sharks, schools of jacks and barracudas with awesome corals. Bliss"
"Easy to spot school of barracuda formation"
"It's THE dive, period. Schools of barracudas and jacks, turtles everywhere, white tip reef sharks, napoleon wrasses, big bumphead parrotfishes and much more. Simply unreal." "Awesome dive site I've ever dived"
"Rich marine life, turtles, sharks, butterfly fishes, colorful bat fishes, grouper, clown fishes. Colorful coral, magnificent!" "Crystal clear water with schools of barracuda, trevally, bumphead parrot fish amongst many others. Wall dive is magnificent." "Fantastic dive with loads of big fish (sharks, turtles, barracuda's etc) but also very colourful"
"I've dived a fair amount around the world and this site is truly awesome. Contrary to what some people on here say, it's teaming with fish. You are guaranteed to see big stuff and lots of it. Been there twice in last two years so 8 dives in total. 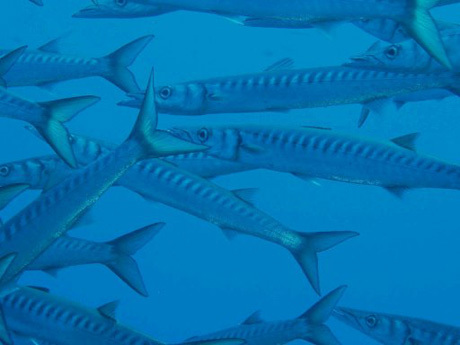 Each day you're pretty much guaranteed to see schools of Barracuda and Jacks. 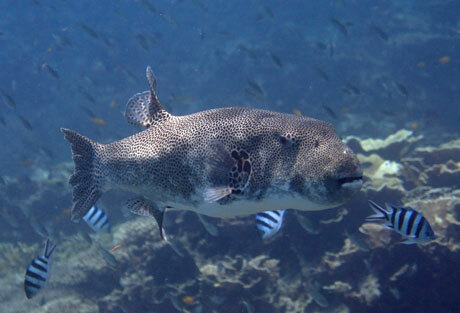 There's a really good chance of seeing school of bumphead parrot fish. White tip reef shares and turtles - lots of both - on every dive, and you're almost certain to see some grey reef sharks patrolling the edge of the reefs. If you're lucky you'll see something more unusual like a hammerhead although I didn't sadly.As for security it's safe. One word of warning some of the currents can be quite strong, but don't let that put you off." "Just go down and enjoy your dive. It is possible to see the bumpheadschool, jackschool and barracudaschool(inside the tornado) in just one dive. Add 10 whitetips, 2 greyreef, and about 20 turtles, single yellowtail barracuda(1,5m),........ "
"There's a reason this is one of the top 10 dive sites! Great opportunity to dive Sipadan (and get to do 4 dives!!!). Definitly need to book in advance, but as long as you do that theres no problems what so ever!" "Massive schools of barracuda, whitetip sharks searching for food, plus so much activity on the reef." "Amazing !!! we saw schools of jacks and rare barracudas"
"It's always good - but if the weather's perfect - it's even better. Loads of things to see on this dive - huge schools of fish. But the best part is the bait ball of baracuda - with the sun shining down the middle and turtles and sharks in the background. Awesome." " Barracuda Point - At the drop off you almost see it all, nursing and black tip sharks, giant trevally, octopi, turtles, schools of jacks then as you go around the corner you encounter a long barrucuda wall. Turtles are abundant and you will get uw photos of them at every angle possible." "Huge school of barracuda, jacks, too many turtles to count and amazing macro life around there." "When this dive is good, it's damn near perfect. Drop off to a sheer wall of pristine coral, with a school of jacks and GTs for company. A lepoard shark might pass as you start counting turtles (42 my best count). White tips and black tips are active everywhere, unlike the sleeping cluster of bumphead parrot fish you float towards. Several Napoleon Wrasse might shadow you along the reef, looking for the same shrimp and octopus as you. Finally you swim up into into a swarm of 1000 plus barracuda, like hanging in a silver dream. Amazing - do it early and more than once. " "With a wall of Barracudas 1 m from your face - a lifetime experience"
"Upon entering the water, I was surrounded by a school of batfish. Later, came across a wall of barracudas made up of thousands of barracudas within an arms reach of me. Absolutely breathtaking! Visibility was excellent. This made other sites seem uneventful. Also saw 4 reef white tip sharks, countless turtles, and a fairly large napoleon wrasse." "This was amazing and I didn't even see the world famous Tornado of Barracudas. Says it all!" "Amazing hurricane of barracudas on almost every dive I made there with sighthings of Mantas as well"
"Tornado of 1000's of schooling barracudas, taking your mind off the fantastic healthy corals." "Barracuda Point is just one of approximately 14 amazing dive sites off Sipadan where barracuda feed. Sipadan is possibly one of the most amazing dive islands in the world with an awesome array of sea life, a 2000 ft drop off and abundant coral. " "The must-dive site in Sipadan -- we dived it every day. Occasional strong currents blast over an underwater prairie that's home to white tips, turtles, grouper, jacks, bumphead parrotfish and of course the barracuda that give it its name." "Barracudas, garden eels and other great macro diving, hump headed maori wrasse, whitetips, turtles, leopard shark, orange frogfish and more on 3 dives down to 35 m."
"Turtles appearing almost wherever you looked, whitetips, clown triggerfish, plenty other fish: hard to decide what to watch." "Actually saw about a thousand or more Jacks swirl in and around me. It was unbelievable!" "Hundreds of barracuda, massive schools of giant bumpheads, lots of sharks, bat fish, you name it was there. Fantastic." "Large pelagic heaven. Leopard Sharks, whitetips, Grey reef sharks, hammerheads, Jacks, Barracuda's and enormous bumphead parrot fish. Oh yeah and more turtles than you can imagine. Also great as it combines big fish action with the awesome macro diving of Mabul. An absolute must." "100's of schooling barracuda, reef sharks galore, turtles, parrot fish, clown trigger fish, frog fish, harlequin ghost piefish etc etc." "Not as good as The Brothers." " It's a superb dive site....It was formed by living corals growing on top of an extinct volcanic cone that took thousands of years to develop. More than 3,000 species of fish and hundreds of coral species have been classified in this ecosystem." "Soft corals at their best, with macro life to match, whilst drifting along turtle highway. " "Just awsome soft corals and turtle, a lot of turtles. Some sleeping in little ledges." "A cave entry at 24 m rising to 4 m inside the cave system, wonderful experience and completely dark when torches turned off. Spooky !" "Sipidan was the best place i have dived in my life. The view from the inside of turtle cavern will stay with me for a very long time. " "Excellent check out dive , before going to Sipadan"
"Shark tip alley and crescent are no longer worth visiting. South & Barracuda Point are your best bets to see the big fish/Barracuda swirl. You need to be lucky though." "The deep deep blue of Sipadan's 1000 metre depths stretch off to one side, while a coral wall keeps you grounded on the other. Plenty of turtles, the occasional white tip and grey shark and lots of little critters to see." "Wall dive. A outer coral wall going down to 600 m. On one dive we saw Dogtooth tuna, giant trevally, green turtles, whitetips and a shoal of several hundred baracudas at 20-30 m depth. On another dive shoals of bump headed parrotfish and jacks, two types of morays, leaf scorpionfish turtles in abundence plus beautiful fans, sponges, small caves packed with whitetips or turtles. Depth from 15-25 m. "
"Here the life was what you might expect from one of the top dive sites in the world. I counted 11 white tip reef sharks resting on the bottom, was passed by a six foot tiger shark going the other way, one Napolean wrasse, too many turtles to count and an octopus in the shallows at the end of the dive. " "Incredible Macro life with giant Moray and basketball size Frog Fish regular sighted." "We did two dives off Mabul which is ten minutes away from Sipadan by boat and offers fantastic muck diving (Lionfish, Moray Eels, Frog Fish, Shrimps etc.) in stark contrast to the incredible visibility and abundance of sharks (oceanic white tip, WTRS and Hammerhead), turtles and barracuda of Sipadan. " "I have spent many dives at Mabul island. It has adopted the term "muck diving". I have seen countless numbers of lion fish, crocodile fish, stone fish, scorpion fish, eels and the infamous frog fish. You have not lived until you have been face to face with a yellow frog fish. My time here should speak for itself. I may never go home. I dive everyday and love every minute of it. If you too want to be hanging in the sea of blue, then get to Sipidan. It is the best dive site ever!" " Kapalai Mabul island has frog fish, crocodile fish, scorpion fish, giant murray eels, leaf scorpion fish, turtles, ...."
"house reef, mabul.... muck diving at it's best." "Awas- Mabul Island, Can't believe theres so much to see just off the jetty!!! Swam right next to a HUGE turtle, saw an eagle ray feeding, and these weird things called frog fish ( now I think one of my favourite fish ever!!)" "Froggy Lair Mabul, all divers come for Sipadan, and they don't recognize that there is a giant grouper family just in front of their bungalow. I saw 5 at on time! 4 with yellow fins, up to 2 m. and a shy giant, think about 2,5 m 600 pound or something the biggest thing I've ever seen under water. Add a jackschool fourtimes bigger than the ones on Sipadan and lots of macrostuff.... and nobody mentions this:( "
"At Mabul Island we dived in the junk underneath the SeaVentures rig. Here were plenty of exotic small creatures (nudibranchs, frog fish etc) but too much man-made rubbish for my liking." "Have you ever looked out from Semporna towards the NE? There are lots of small floating villages and is not especially over-dived due to the excessive marketing for Sipadan. Well there is a reef sytem that rival The hanging garden of Sipadan. It is not a wall but soft coral and carpet anemonies abound. Small brightly colored reef fish are most abundant. The coral slant down towards a sandy bottom at 30 meters. Here you can have a good time checking out the benthic community. It is best to hire a local fisherman to take you there. Location East side of last floating village head out of Semporna on a NE heading. About 1 half hour to 45 minutes out. " "If you want a great dive 5 mnutes from Semporna, dive off the 2nd Harbor marker NE of Semporna. It is the damaged one. Staghorn, clump and ridged coral abound at 10 meters. It is a good solid dive, not the best but for a quick investment of time and only a small amount of money well worth it. You need to hire local boat. If unable to hire Scuba-Azusa, I recommend you talk to Tino at SCUBA JUNKIES, he knows the site." "600m Drop off from the reef about 8 metres from the beach. Endless amounts of fish reef. Scools of Jack Fish, loads of Green Turtles, Reef Sharks, Barracuda. Unbelievable scenery! My top dive so far." "Huge wall that goes on forever, loads of turtles and Nudibranchs hiding everywhere, thank goodness for the keen eyes of our divemaster, I would have missed them without him!" "600m Island of Pulau Gaya in the Tunku Abdul Rahman Park has lots of sites. Brilliant views. Great experience.."
"Good dives with lots of marine life and a variety of different sites with good coral reefs both real and artificial and a small wreck in one location." "Fanastic diving, good clear waters and lots of marine life, corals as well as a couple of large wrecks." "Sipdan Island is now closed to overnight stays, so the dive resorts are moving back to the Mainland and Mabul. There are several floating resorts such as Kapili, but the famous beach at Kapili was a no go do to the local seabirds or the tides timing didn't mesh with the diving schedule. If you book locally, you stand a better chance of getting a solid deal. I mean you must book in Semporna or the middlemen will take advantage of you. Also shop around and know what you are comparing. I think the diving offered in this area is better than Thailand and better value. Also it is a great place to jump off for diving in Indonesia and the rest of Malaysia. Also tourist are safer in Malaysia due to the uniqic overlay of several interlocking security forces, made up of local police all the way to Federal police forces, whose mission is tourist security. I doubt you would be a victim of a violent crime (Thailand has many), but larceny and petty theft are more likely to visit the tourist who is unsavey and dosen't take precautions." "A mixture of Wall and reef dive, loads of wildlife, including black tip, grey reef leopard,(plus others saw Hammerhead)Sharks, Turtles, Humphead Parrot Fish,huge numbers of Jacks,plus of course the famous Barracuda vortex all within a comparatively short distance "
"You know when Nemo went to the edge of the deep? Well that is the same feeling I had looking out and down into 700 meters of water off Sipadan. One of the best dive sites. But how do you compare Monterey bay the best ever dive site with the tropics???" "Friends of ours were kidnapped from Sipadan Island by Muslim rebels and held hostage for nearly 4 months. I would like to warn divers to look carefully when booking diving in the East - as there seem to be a lot of corruption and danger not told to divers by travel agents." "I dived the Sipadan/Mabul islands in March 2003 and found absolutely no problems when I was there. In fact, I also met a large group of divers from Texas who tell me they come 3 or 4 times a year to Sipadan and have encountered no problems. Friends from all over Europe have also dived there recently and tell me only good experiences, so pls don't let anyone deter you from coming to dive this wonderful site." " Definitely worth checking out Semporna as a base for diving Sipadan - especially as Sipadan has now been cleared of the operators on environmental grounds - it is likely that a few more local operators will set up in Semporna. Using Semporna as a base firstly has the advantage of economy - we paid around Rm300 each for 3 boat dives, plus accommodation (we stayed at the pretty basic, but ok Dragon Inn) is virtually free. In addition, you have the option of hanging out in Semporna vs. being stuck on Mabul in the evening and can take a rest day without feeling guilty about all the money you've shelled out. The comment about people getting kidnapped from Sipadan is highly alarmist. Whilst it's a true story, you're probably in greater danger in Paris or London-- we saw several police/military boats in the area patrolling for illegal fishing, smuggling, pirates etc. " "Sipadan has been built up to be one of the best dive resorts in the World, it did not live up to expectations. There is much damaged coral and many of the larger fish (hammerheads/Manta etc) are not as evident. The turtles are still a joy though! Shark tip alley and Staghorn crescent are no longer worth visiting. Hanging gardens/coral gardens have lots of smaller species and reef fish. South & Barracuda Point are your best bets to see the big fish/Barracuda swirl. You need to be lucky though! Good however not as good as the brochures say." "The dive sites are some of the best we've seen. The number and the size of turtles we've already seen is just astonishing. We've seen several white tip reef sharks, some black tips, the hugest great barracuda imaginable and so many beautiful, colourful reef fishes from the big to the tiny that I couldn't begin to name them all. The coral here is just absolutely pristine. We've dived in the Caribbean, the Red Sea and the Similan Islands in Thailand and the Perhentian Islands in Malaysia and this is by far the best place we've dived." "I have been stationed in Semporna for over two months. The diving around Sipidan island is amazing. Sharks, turtles, mantas....oh my! Wall diving around this tiny island paradise has it all. " "I have dived many places but sipidan is out this world! " "I personally rank Sipadan Island as the finest diving site in our earth." "Sipadan island, off the coast of Sabah, Malaysia is unbeatable in it's beauty." "Danger lurks everywhere. You will be very safe in Semporna. Don't let rumours deter you. Pleae do visit." "The most amazing amounts of LARGE fish in LARGE schools, sharks, turtles and barracuda. We stayed on the small island with a limited number of guests with unlimited diving. You could dive right off the shore at a wall with a huge drop off or go boat diving. It was amazing! Sipidan Island was better than any diving we did in Australia!" "Me and a group of friends dove the Sipadan Island for 5 amazing days. We stayed on the Mabul Island with Ungle Changs divers which was excellent. All the dive sites around the Sipadan are amazing with the Drop Off being the best, 700 m deep of pure amazing blue water a clear as the eye can see. During a deep deep dive we came acroos a school of Hammerhead sharks a truely unbelievable sight that we will never forget." "One of the greatest dive sites on Sipadan is the 'drop off', which is a wall of the atol going down 2,000 feet. You reach it from beach in front of Borneo Divers. A short swim of 50 feet or so and you're on your way down! Just amazing to drift down the wall to see white tip reef sharks, morray eels, turtles, giant bumphead parrot fish, large grouper & numerous nudibranches. A little creepy and exhilirating to go over the wall on a night dive wondering what is lurking below! Turtle cavern was a rare treat. One of my favorite sites was seeing huge schools (est. 500-700) of barracuda swirling in a giant circle around and around and around. It made a humming noise you could actually hear! Those were seen on 2 dives, Mid-Reef towards White Tip Ave and South Point. We also got to see giant green sea turtles in all stages of life: mating; laying eggs on the beach, and hatchlings going to the sea! All in all we saw (over the course of 14 dives) 70 turtles and 70 sharks! When we were there you could stay on the island, but that is not allowed now as I understand it. Hopefully that will help preserve the beauty and abundance of fish live at Sipadan." "Sipadan-The whole island is ubelivable beautiful! You need to go there once in your life!. Pulau Mantabuan - Gorgeous coral gardens. Not so many fish, but colorful corals all over!!!" "Sipadan is absolutely amazing, so many turtles, sharks and other medium to large size fish. The amazing thing about Sipadan is that the smaller stuff and the coral is beautiful and plentiful. Possibly the best dive site in the world, although I haven't been to that many as there are too many to dive! "Sipadan had the Wow factor with great vis, low diver numbers and abundance of macro and pelagic. Turtles and whitetip sharks in absurd numbers and the tornado of barracuda seems to drift around the island, with its white sandy palm fringed beaches, all day round. " "The Australian Wreck as it is named, well, it is not Australian at all. Formerly the ship was a 1909 Dutchbuilt steamer called the SS De Klerk. Scuttled by the Dutch off Peninsular Malaysia in 1942. Some years later, it was re-floated by occupying Japanese and used again! That said, sank once again in 1944 when she hit a Japanese mine. The wreck lies on a 33m deep sandy bottom, is mostly intact but tilted onto the port side. This is also a whopping 85m long hull so there is plenty of ship to explore. For those certified to do so, the Australian wreck is the best � meaning easiest and safest � to penetrate, along with the Cement Wreck. " "The American Wreck, well, at least it is American! Formerly the USS Salute 470 and was built in 1943 as a minesweeper. This 75m ship saw lots of action in WWII, but sank after hitting a mine in 1945. Due t the nature of her sinking, as you can expect bare the most scars of all the wrecks here, with the bow collapsed lying spread out along the seabed, virtually separate from her slightly more intact stern. Penetration dives into this wreck is not advisable, but divers will enjoy exploring around both sections. marine life." "A wreck in 30 metres off Labuan, Malaysia. Awesome viz, superb wreck and magical marine life." Layang Layang is a small atoll of 13 coral reefs. It is one of the 600 islands and reefs in the South China Sea which are collectively known as The Spratly's. It has lovely diving with both large pelagics like hammerhead sharks and also beautiful macro diving. The best time to dive Layang Laylang is between April and June. Hammerhead mating season is in April and May. Previously called Swallow Reef, in fact Layang Layang means Place of Swallows. The name comes from the birds on the island, which is a bird sanctuary. You can dive Layang Layang from a liveaboard or a resort. "A marine park for more than 15 years it is as good as Palau and better if anything than Sipadan. I would definitely dive there again as the marine life is outstanding." "Big schools of hammerhead sharks in the morning dive, very rich fish life, napoleon, manta, rays, turtles etc etc." Thirty metres down lies a cave which is home to several white tip reef sharks. Also in the area is a chance to see hammerhead sharks, grey reef sharks, manta rays and eagle rays. We endeavour to keep this site as informative and current as possible. If you would like to recommend or warn about a particular dive or diving location we'd love to hear from you.